In an effort to catch up with films that may end up on my top 10 films of the year I managed to see Steven Spielberg's War Horse last week and was suitably impressed. It is an outrage that anyone would slur this utterly beautiful piece of film making. I could go on about being biggest fan of Steven Spielberg's recent output for some inexplicable reason and hankering for his more adult films and intelligent exploration of less mainstream themes - but Steven Spielberg is a living legend and master film-maker with an incredible body of work that one has to appreciate regardless. But you know that already. Although it is on my list of things to do I have still not seen War Horse the play on which Spielberg's film is based. And wasn't entirely sure what to expect from the film, apart from a horse becoming the embodiment and projection of human spirit in a war situation that ends sadly. Well War Horse could be about that - but Spielberg takes on an incredible journey with interesting characters and set ups that continually surprise to get us there. Although it is a bit sad that we have become so desensitised to the horrors of war that new ways of addressing it are dreamed up. Too be honest I was surprised how un- cliché the characters of War Horse actually are. As we have have come to expect a certain range and distillation of character traits when it comes to war stories. I'm unsure of where the credit needs to go the playwright or Spielberg's adaptation - but War Horse is a fresh look at the timeless themes of war mainly driven home by the intelligence of the characters. Although it is steeped in sentimentality and relies heavily on emotion War Horse is engaging and and compelling experience as it moves from one set piece to the next. With some genuinely great performances and moments. Particularly from; Peter Mullan, Tom Hiddleston, Toby Kebbell, Finder the horse and Benedict Cumberbatch. 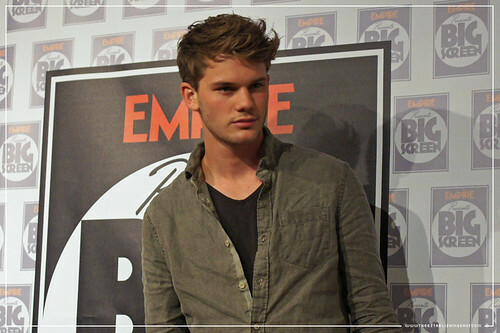 But young Jeremy Irvine's subtle and understated performance as a Devon farmer - especially from a lead character that has to carry much of the film's emotion is absolutely outstanding. Much of this a testament to Spielberg's skill as I can't help but think that Steven Spielberg shaped and moulded much of these performances to get exactly what was needed to make the film work - as well as it does. One of the elements that distinguishes Great Director from the also rans. 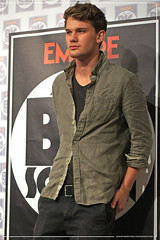 Empire BIG SCREEN : Jeremy Irvine talks War Horse and working with Steven Spielberg in the press room, a photo by Craig Grobler on Flickr. I enjoyed Irvine's performance so much so that I dug up this QA session with him from last year. 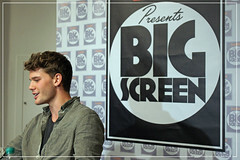 I was fortunate to pop along to Empire's Big Screen and sit in on a conference with Jeremy Irvine about War Horse and working with Steven Spielberg, unfortunately I did not have much to ask him and the camera & sound are not ideal as I had intended to transcribe the interesting bits from the session but being time short I thought I would get the clip up in its entirety. From director Steven Spielberg comes “War Horse,” an epic adventure for audiences of all ages. Set against a sweeping canvas of rural England and Europe during the First World War, “War Horse” begins with the remarkable friendship between a horse named Joey and a young man called Albert, who tames and trains him. 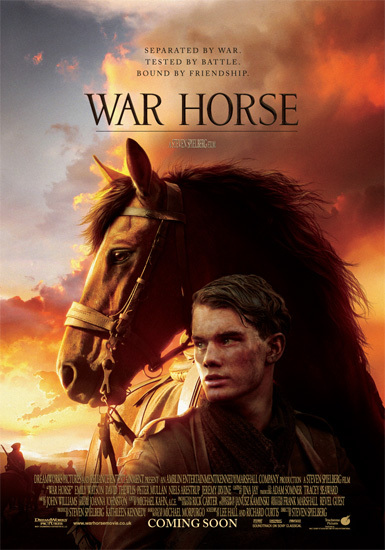 When they are forcefully parted, the film follows the extraordinary journey of the horse as he moves through the war, changing and inspiring the lives of all those he meets — British cavalry, German soldiers, and a French farmer and his granddaughter — before the story reaches its emotional climax in the heart of No Man’s Land. DreamWorks Pictures’ “War Horse,” director Steven Spielberg’s epic adventure for audiences of all ages, is a tale of loyalty, hope and tenacity set against a sweeping canvas of rural England and Europe during the First World War.